The Hackathon week is over and looking back on it the eTRAP team agrees…it was a hit! 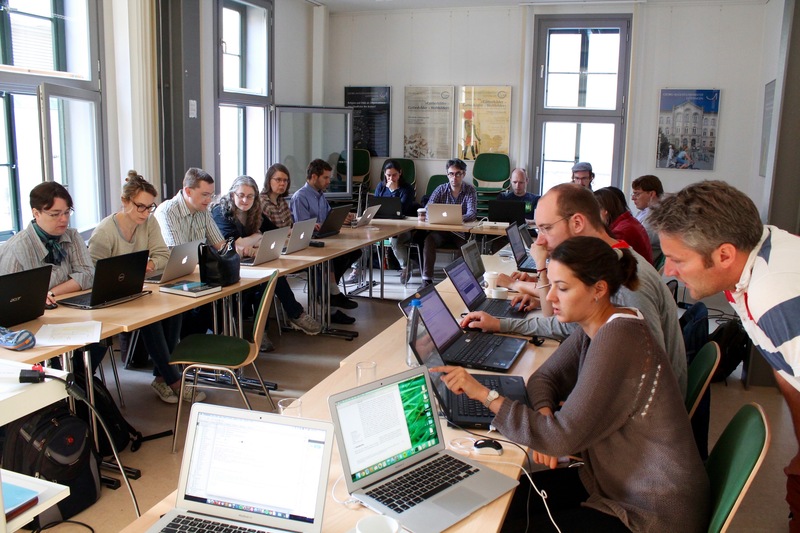 23 participants from 15 different institutions and 8 countries hacking away at research questions on their laptops to achieve the same goal, albeit with different datasets. And the goal was achieved. Our hackers were humanists with a desire to find textual reuses across different works of the same author or across several authors from different times and locations. They brought data in English, German, Latin, Sanskrit, Hebrew and even Arabic and Estonian, spanning across many genres – from folkloristic poetry, to narratives and letters, from lists of citations to biblical texts. From day one they were led by computer scientist and leader of eTRAP, Marco Büchler, through each of the six steps required by the TRACER tool (1) to perform scans of the texts in search of reuse. By using the command line like pros, hackers preprocessed their data and set the parameters they needed to guarantee the most informative outcome. The week culminated with a tutorial on TRAViz (2), an open source variant graph visualisation tool created and presented by Stefan Jänicke (3), which allows users to create a swish visualisation with the results yielded by the TRACER tool. With this post we would like to again thank all of the participants for attending our first ever hackathon, which was fully booked! You worked with enthusiasm and scholarly concentration, and provided us with the feedback we needed to offer an even better experience next year. Thank you also for the encouragement you gave us, verbally and in the form of tweets – we enjoyed watching the buzz it created online. We are happy to say that our newly established early career research group is definitely off to a good start! Check out our Gallery for pictures of the week! Want to catch up? Have a look at the original Hackathon call. Download a summary of the feedback forms the participants kindly filled in. The green tick represents the box with the most votes. Do not hesitate to email us for more detailed information. (1)TRACER is available upon request. Visit our Contact page. (3)Stefan Jänicke is a research assistant at the University of Leipzig in the Image and Signal Processing Group within the eXChange project.